I think he’s right on, but there’s more to the story. Brands aren’t solely formed of audience belief or market opportunities. They are the creation of driven, hard-working, vision-casting individuals who put bits of themselves into their organizations, whether it’s their passions, perspective, or merely sweat equity. To completely cede the soul or mission of a brand to the opinions of others means leaving out an essential slice of the organization’s DNA. We believe that the sweet spot of powerful, authentic brand identity (and communication) lies at the intersection of an organization’s view of itself (the Authorial element) and the connection the brand makes with those in the world (the Responsive element). 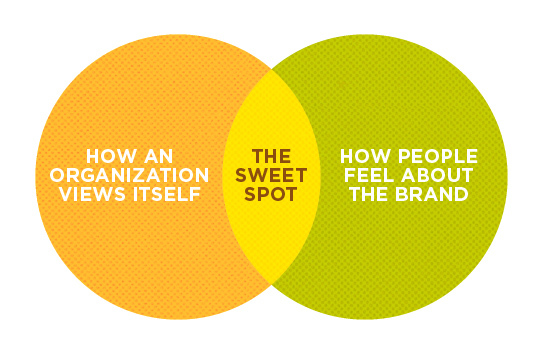 When a team or organization can weave a brand story and overall identity that integrates both of these elements, it has achieved the sweet spot, a place of lasting connection and success.